The new wage laws will increase minimum wages, but won’t strengthen the wage-enforcement system. 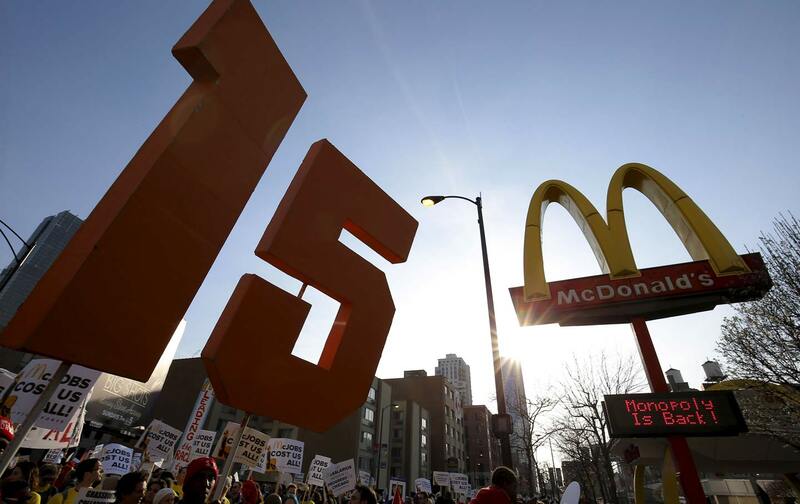 Feeding off the fury of fast-food workers’ protests, cities and states have been surging to raise their minimum wages across the country. The nation’s capital is poised to pass a new $15 hourly minimum wage, on the heels of New York State and California, which just enacted the first statewide $15 hourly base wages. Since 2012, about 17 million workers nationwide have received newly enacted or pending minimum-wage hikes, to be phased in over several years. But as the wage floor inches up nationwide, it’s continually falling out from under the feet of millions of struggling workers. Thanks to structurally weak enforcement of labor standards, any new law promising to raise pay scales often isn’t worth the paper it’s printed on. Whether the minimum wage is $8 or $15 might be immaterial to countless workers who are denied legal recourse against cheating bosses, mainly because of the lack of any meaningful consequences for crooked bosses. So they get away with skimming an estimated $50 billion in “stolen or unpaid wages” each year, according to the Economic Policy Institute (EPI). It’s essentially the tax imposed on poor workers through an institutionalized cycle of precarious working conditions, threadbare regulation, and vulnerability to exploitation. At the state and federal levels, the rules are typically rigged so that, even in the rare instance of a successful wage-theft claim, the victim still might never be made whole. As the EPI notes in a policy brief, under the keystone federal wage-and-hour law, the standard punishment for wage theft is to repay the amount owed plus “an equal amount as liquidated damages.” But in reality this leads to “often no more than an order to pay back the wages that were owed, or even a fraction of the total amount,” because of the limitations in the damages formula. Thanks to weak enforcement, any new law promising to raise payscales often isn’t worth the paper it’s printed on. The wages owed are calculated as double the amount of underpayment based on the minimum wage. So say your boss shorted your $10-an-hour wage by secretly clocking you at $5 an hour. Under current rules, the Labor Department would calculate damages owed according to the federal minimum, as $7.25-$5 = $2.25, which then can be doubled to $4.50 including damages. That’s much less than backpay calculated according to the real amount stolen, $5 per hour (plus $5 in damages); you still lose—and the boss gets to keep—$5.50 per hour. The wage-enforcement system is further weakened by toothless penalties, the EPI says, because “Even for repeat or willful violations the maximum penalty is $1,100,” though for decades the Labor Department has “failed even to seek a penalty in most of its cases.” Theoretically, the worst violators could face six months imprisonment, but federal criminal wage theft charges are virtually unheard of. The law doesn’t account for the fact that at a multinational automaker that shorted workers on overtime faces the same penalty as a household that underpaid a domestic worker, so there’s little deterrent value for large firms. A wage-theft reform bill introduced earlier this year in Congress would help close some of these loopholes: the basic penalty would be raised to $2,000, $10,000 for “wilful and repeated” violations. It would authorize triple back pay, which puts the legislation in line with recent academic research on local wage enforcement systems showing that reducing wage theft requires penalties that employers actually feel in their pocket. Comparative studies of regulations in different jurisdictions shows that meaningful deterrence generally demands penalties on the order of triple, not double damages. The federal reform proposal has stagnated in Congress, but New York State and Washington, DC, both recently enacted notably strong anti-wage theft laws. In DC, for “willfully” committing wage theft, a repeat offender might be fined up to $10,000 per worker, or “imprisoned not more than 90 days.” The New York law could impose penalties up to $20,000 for repeated violations. In addition, the DC law expands the ability of victims to bring class-action suits, which could dramatically enhance employers’ legal liability for large groups of aggrieved workers by making litigation more affordable. Another provision of the act would make it easier to hold temporary staffing firms liable for wage violations—a particularly tricky area of labor law affecting a growing number of precarious contract employees. But in many cases, the enforcement mechanism doesn’t even kick in, since the wage-and-hour regulatory infrastructure is handled by a chronically understaffed and underfunded federal agency. Although some cities like San Francisco and New York have established specialized regulatory offices to more comprehensively enforce wage laws, nationwide the process generally relies on a complaint-driven process. With about 1,000 federal Wage-and-Hour Division investigators to cover a workforce of some 100 million, chances are the average workplace will remain untouched in a worker’s lifetime, especially when the most vulnerable poverty-wage workers may be reluctant to report their bosses. The weak regulatory system is even more incompetent at tackling the cleverer methods of evading wage laws, like misclassifying workers as non-employee “contractors,” exempt from fair-labor standards. And then there’s the basic truth about the minimum wage today that undermines its effectiveness writ large: It is too damn low. Without a meaningful chance of their being made whole, it may simply not be worth the cost of pursuing a wage theft claim for impoverished, precariously employed workers without legal help. So labor advocates have won major gains in raising wage standards on the books, but with such weak enforcement that those wages might never appear on their paychecks. Without higher costs imposed on crooked bosses, the government will not only fail to uphold wage standards but help undermine them, as an accessory to corporate crime.